"Learn About The Benefits Of Denver Monofilament Wigs!" Monofilament refers to the type of material that hair strands are sewn onto. Unlike a cloth material, which can be itchy to those with sensitive scalps, monofilament material is a thin gauze-like, nearly transparent material which is much more comfortable to the touch. Hair strands are attached by hand-knotting them to this material, one strand at a time, hence the term "mono-filament". This allows the strands to swivel freely on base and so the monofilament wig is more easily styled. This weaving technique also creates ventilation. Your monofilament wig will breathe while worn, and this prevents heat and moisture buildup. The monofilament fabric itself is nearly transparent, and so takes on the approximate color of your own natural scalp, whatever shade that is. 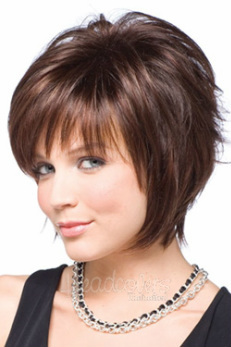 This amazing "chameleon" effect is another plus to the monofilament wig design. It has been said that a monofilament part is the most natural looking part in the wig industry, because it bares the natural scalp color of the wearer. Today's monofilament wigs are not 100% monofilament, but have a section in the back which is more traditional in construction. This allows you to adjust the size of your fit to perfection. You may even wish to adjust the fit during the course of an evening's wear, and this is of course, quite easy to do. Tape tabs are included with all mono wigs, and these may be used or ignored, depending on your situation or preference. Rene of Paris' Amore series , offers a double layer of monofilament for added comfort. Rene of Paris has been a leader in the wig industry for over 30 years, and this sort of extra step is something we have come to expect from them. They call it two-layer construction (TLC), but that also might mean tender-loving-care which is the sort of commitment they have in making all their wigs. The Louis Ferre mono wigs we offer are also similarly designed to the image below, which is an under-side view of a monofilament wig. Are monofilament wigs for you? 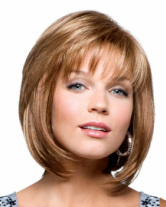 Monofilament wigs are specially designed for those with severe or total hair loss. Most of their advantages are in comfort, but there are some advantages to their natural styling ease as well. All of the comfort advantages are brought back to square one, if you have a full or average head of hair. You will have to decide if the styling advantages are worth the additional cost of a mono wig. Though wigs and hairpieces have become trendy, for most people, selecting a wig with so many options to choose from can be challenging and a bit confusing. Evergreen, Lakewood, Longmont, Brighton, Aurora, Erie, Englewood, Highlands Ranch and Surrounding Areas.